This program does not include a book signing. All books will be pre-signed by the author. Instead, ticket holders can have their picture taken with Jenner following the talk. 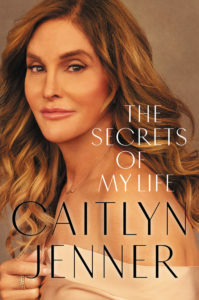 In The Secrets of My Life, Jenner shares details of her childhood as Bruce Jenner and rise to fame as a gold-medal-winning Olympic decathlete; her marriages and her relationships with her children; her transition and experiences as the world’s most famous transgender woman. In conversation with Buzz Bissinger, a Pulitzer Prize-winning journalist and the author of the #1 New York Times bestseller, Friday Night Lights. Immediately following the event, Rabbi Suzy and Josef Palermo, Director of GLOE – The Kurlander Program for GLBTQ Outreach & Engagement at the Edlavitch DCJCC – will facilitate a short conversation for anyone who wants to share any thoughts sparked by Jenner’s talk in a smaller setting. Free for all event ticket holders to attend.